Quiet and peaceful, with City convenience. Welcome to our completely furnished two bedroom apartment in a convenient South St. Louis County location. 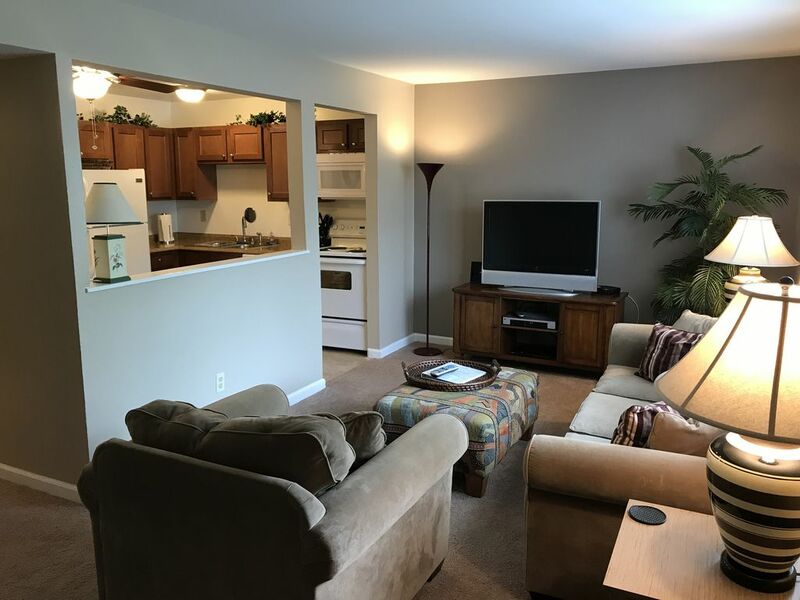 This unit offers newer carpeting, complete furnishings, a 37' HD TV with basic cable, Wi-Fi, A/C, and plenty of parking. You are 15 minutes from downtown St. Louis with restaurants, Busch Stadium, Arch, Six Flags Theme Park, St. Louis Zoo and Botanical Gardens. Relax and enjoy our community pool when not sightseeing. We are in the vicinity of Butler Hill Road and Tesson Ferry Road in a quiet residential neighborhood in a great area of St. Louis County, outside of the City of St. Louis. Our location can't be beat -- quiet enough to listen to the birds all day, yet we are within 1-2 miles of all needed amenities: shopping, restaurants, parks, recreation center, YMCA, hospital, public transportation, and great highway access. Approximately one mile from I-55 and/or I-270, and close to Hwy. 30 and Hwy. 44. Located mid-way between St. Louis City attractions and Six Flags theme park. I am a STL native and came in town with my wife from Florida for about 3 days for some time away. Alan’s place is clean, has all the conveniences of a hotel and is centrally located to everything you could want to do in the city and county. Safety is always a priority for me when I choose a place to stay in STL and at Alan’s I could comfortably know that my car and things were safe. Alan’s communication was stellar and I would definitely stay here again. We met our daughter and grandson for a long weekend. We checked in Friday afternoon and left Monday morning. The apartment was clean and comfortable with a fully stocked kitchen. The beds were comfy and the towels plush. We were 10-15 minutes from Grants Farm and the Magic House. Lots of restaurants within close driving distance. We felt safe in the neighborhood and we will stay here again. It was a nice place to come back to after a long day. It had all the amenities of home. This was a great apartment for my family during our stay in St. Louis. It was very clean and updated. It also had almost everything we needed from dishes & spices to towels & soap. The property is a bit old but well maintained. The pool was clean and very refreshing with the record high temps! I would definitely stay here again. Nice and relaxing with the comforts of home! Very clean and well maintained apartment. We enjoyed our stay and would definitely rent again the next time we visit St. Louis. Thank you Alan! Enjoyed our stay! We appreciated the good location and the easy access to the apartment. The apartment is well stocked for all your needs. Thank you Alan for your helpful and friendly assistance! South County Recreational Complex - 2 mi. Suson Park - 2 mi. Bohrer Park - 3.5 mi. South County Center Mall - 3 mi. St. Louis City Museum - 16 mi. Busch Stadium Home of the Cardinals - 16 mi. World Famous St. Louis Zoo - 16 mi.